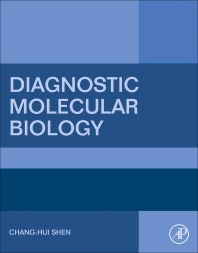 Diagnostic Molecular Biology describes the fundamentals of molecular biology in a clear, concise manner to aid in the comprehension of this complex subject. Each technique described in this book is explained within its conceptual framework to enhance understanding. The targeted approach covers the principles of molecular biology including the basic knowledge of nucleic acids, proteins, and genomes as well as the basic techniques and instrumentations that are often used in the field of molecular biology with detailed procedures and explanations. This book also covers the applications of the principles and techniques currently employed in the clinical laboratory. Chang-Hui Shen, PhD, is a Professor of Biology at the College of Staten Island, City University of New York, New York. Dr. Shen graduated from the National Chung-Hsing University, Taiwan, with both a BS and MS, earning his PhD from the University of Edinburgh, UK. He previously was a visiting fellow of the National Institutes of Health before taking a position at the College of Staten Island, City University of New York. Dr. Shen’s research focuses on understanding the mechanism of gene expression, with an emphasis on the roles of transcriptional coactivators in gene activation. He also pursues such topics as the regulation of programmed cell death through major cellular signal transduction pathways and transcriptional networks in the cell, as well as epigenetic regulation of neurodegenerative diseases. Dr. Shen has been teaching Diagnostic Molecular Biology for more than 15 years.